One of our epic art installations. Leave your rubber ducky at home. Bring your blanket instead, for this super relaxing immersion! According to cutting-edge doctors from Harvard, some of the deepest most profound healing in the body is accomplished with sound frequency. 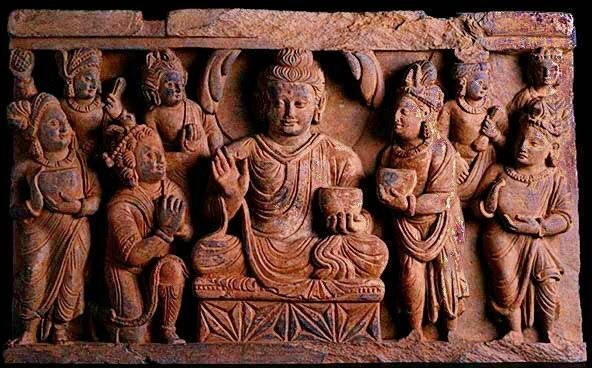 A 2nd century stone relief in the Himalayan mountains shows Buddha and his buddies playing ancient Tibetan singing bowls. A Human Activation sound frequency specialist will be playing several of these rare Singing Bowls, some of which are over 200 years old. A magical alchemy of 7-12 different metals rings in the past, present, and future for our relaxing enchantment. Experience these gifts from the past in this NON-religious practice of our present. Come be rejuvenated or just captivated by this unique musical performance. Bring your pillows, blankets, and yoga mats and snuggle into the comfort of the tranquil sounds. Feel free to sit, lay, or even stand! Proceeds go to support the Crystal Ashram 501(c)(3) non-profit where the Human Activation School of Expanded Consciousness will be held. Questions? Email monte@crystalashram.com. Text or call 703-395-4990. Bring your blankey instead, for this super relaxing immersion! According to cutting-edge doctors from Harvard, some of the deepest most profound healing in the body are accomplished with sound frequency. Even modern doctors are using these old metal bowls for healing, and they are not practicing Buddhists! Bring your pillows, blankeys, and yoga mats and snuggle into the comfort of the tranquil sounds. Feel free to sit, lay, or even stand! All proceeds go to support the Crystal Ashram 501(c)(3) non-profit where the Human Activation School of Expanded Consciousness will be held. http://humanactivation.com/. Pre-payment & Registration required. To sign up, click here. Proceeds will help support the Crystal Ashram 501(c)(3) non-profit where the Human Activation School of Expanded Consciousness will be held. A magical alchemy of 7 -12 different metals rings in the past, present, and future for our relaxing enchantment. Meditating with singing bowls reduces blood pressure more than meditation alone. “The sound bath meditation is a welcome addition to my meditation practice. The unique sounds produced by the bowls helped me to have a deeper and more meaningful experience. The calming and welcoming presence of the hosts allowed me to feel very comfortable from the minute I walked through the doors. Thank you!”-Teresa A. Proceeds will support the Crystal Ashram 501(c)(3) non-profit where the Human Activation School of Expanded Consciousness will be held. Walk-ins allowed. Please register at Dream’s website. 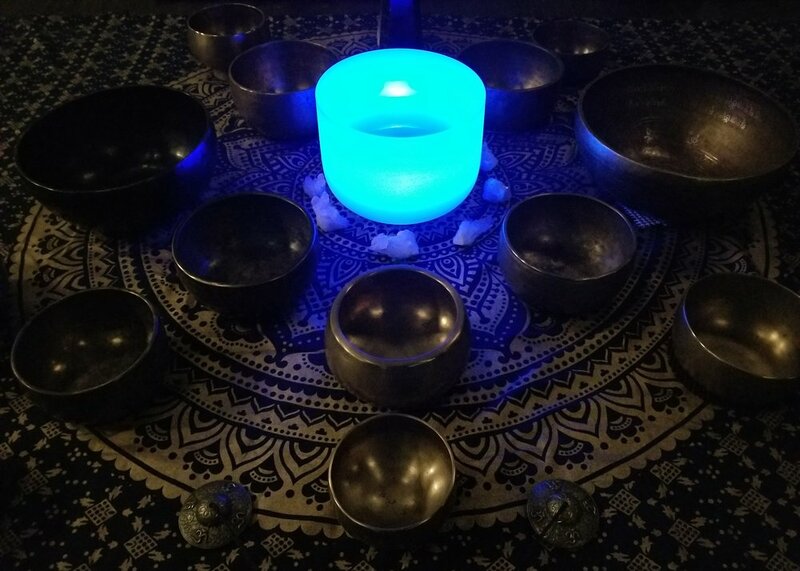 This meditation is typically open to people who have been to one of our sound bath meditations, at least once, and are familiar with our orientation. Why? Because there will be no pre-talk, debriefing, and preparation for newbies at this meditation. This exclusive meditation will maintain a most sacred and silent opportunity for attendees to go deeper into the frequencies offered. There will be no cell phones allowed in this room. You might want to leave them in your car, please. Only whispers will be heard in the reception area and absolute silence maintained in the sacred space. The meditation will be open-ended on the back end, but should not exceed 1 hour-and-a-half, and leaving early from this meditation will be discouraged in order to sustain the sacred silence. For those of you who choose to lay down, to maintain the sacred quiet space, we encourage only quiet rubber yoga mats and soft blankets. This will also be a simple and pure offering, featuring fewer bowls and no elaborate crystal grids. This minimalistic offering will allow each individual master bowl to be heard in its entirety and felt with more intimacy. There will be no framework or theme for this meditation, as it will be conducted intuitively in-the-moment. This silent contemplation will allow for more advanced realization, and a deepening of our intentions to be more expansive in our experience with the frequencies provided. So, whether you’re looking for the next expansion in your meditative experience, or to just add a second opportunity per month to be with the bowls, this will be your chance to enhance. Contemplative Conversation will follow after the collective experience is complete. All proceeds go to support the Crystal Ashram 501(c)(3) non-profit where the Human Activation School of Expanded Consciousness will be held. Questions? Email monte@crystalashram.com or visit crystalashram.com. Text or call 410-980-1324. The Deepening Meditation in NoVA! This meditation is typically open to people who have been to our previous sound bath meditations, at least once, and are familiar with our orientation. Why? Because there will be no pre-talk, debriefing, and preparation for newbies at this meditation.